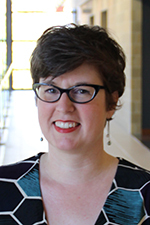 Kelly Thornburg, director of scholar development with the University of Iowa Honors Program, is the recipient of the 2017 Lola Lopes Award for Undergraduate Student Advocacy. The award recognizes administrators, staff, or faculty outside of their teaching role who serve as strong and effective advocates for undergraduate students and the undergraduate experience. Recipients are selected by a committee of staff, faculty, and a student. Since joining the honors program in 2010, Thornburg has mentored over 40 national fellowship winners and more than 70 institutional nominees for major national and international scholarships, including four Truman Scholars, two Churchill recipients, a Gates Cambridge Scholar, nine Goldwater awardees, and one Rhodes Scholar. During her tenure, she has continued to develop the university’s Truman Scholarship program and supported four Truman Scholars and finalists and/or winners each year, and the UI has been named a Truman Scholarship Honor Institution. Two UI students have received Rhodes scholarships—the first UI recipients in more than 20 years. In addition to coaching current students and alumni through the lengthy and rigorous process of applying for national fellowships, Thornburg coordinates application, selection, and nomination processes for nearly 100 internal scholarships and institutional awards for current undergraduate students each year. She also regularly facilitates knowledge and skill development through writing workshops, peer review sessions, and opportunities for students to get to know past scholars, local advocates, and campus leaders. One of these experiences is the Fellows Project, a two-year undergraduate fellowship developed by Thornburg that offers some of the UI’s most academically successful students a chance to explore the intersection of intellect and emotion in a purposeful way. With its focus on helping students learn to observe how their values, beliefs, and ideas interact, the Fellows Project exemplifies Thornburg’s approach to scholar development. In all of her work with students, Thornburg’s primary objective is to create a space where students can learn to value and practice self-observation in the context of the larger culture. Through focused personal engagement and enthusiastic advocacy, she challenges and supports students as they question their assumptions about who they are, what is most important to them, and how both will shape how they contribute to the world as people and professionals. Thornburg will receive a $1,000 honorarium and a certificate, and her name will be added to a plaque that will be displayed in the Admission Visitors Center. The award is named in honor of Lola L. Lopes, former associate provost for undergraduate education and professor emerita of management and organizations in the Tippie College of Business. Lopes served as interim executive vice president and provost during 2007–08.